The longer days are a sure sign that the Spring season is right around the bend. That means warmer weather, spring cleaning, and lots of time to prepare your home for the hot summer. 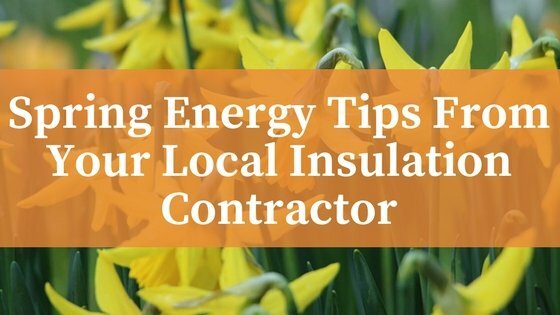 Here are some energy saving tips from the insulation contractors at Dimensional Contracting. Here is an obvious tip, installing insulation with the appropriate r-value in the areas where your home needs it most. Insulation acts as a barrier to heat transfer, keeping your home cool in the hot summers and more comfortable in the winter. Spring is a perfect opportunity to get ahead of the hot summer and upgrade or improve your insulation before it’s too late. You don’t want to wait until you’re laying awake while sweating all night and losing sleep. One of the most common problems we see in customer homes is leakage in areas of the attic. People call us and ask why their electricity costs are so high and why their HVAC unit runs constantly and we often find the reason is because that cold air from the AC is leaking right out through the attic, and worse, the attic is heating up and warming the whole house. This results in a problem that attacks your home’s efficiency from two angles, and costs you a lot of money. Attics are easy to overlook. You rarely go up there unless its to store something or bring something out of storage. Out of sight out of mind as the saying goes. Unfortunately this is an often neglected area in terms of energy efficiency. The attic should have the appropriate radiant barrier properly installed, it should have the right vapor barriers in place, and it should have insulation with the best appropriate r-value for the Texas climate. Good attic insulation installers know the right r-values, and the right installation methods to fix and upgrade all of these areas. Additionally, all of the ventilation areas, hatches, and other parts of the attic must be properly insulated so that the insulation comes together in those areas snugly to avoid unnecessary temperature seepage. All too often we come into someone’s home to find the previous contractor or homebuilder neglected to add these finishing touches and only installed the bare minimum insulation to pass inspection. Folks, don’t settle for the bare minimum when you could be saving money every day on heating and cooling. You don’t see them, but you have holes in your walls. Just behind your paint, wallpaper, and family photos, there is space that should be full of the appropriate insulation with the right r-value. Chances are good that this is not the case and you’ve got holes in your walls where heat is invading your home during the summer and escaping in the winter. Our expert team can easily identify areas where temperature loss is occurring and install the right insulation to fix those problem areas and patch those holes. Additionally our team offers spray foam insulation to fill walls quickly and efficiently even in hard to reach areas. You don’t need a pro for everything of course, and there are some things everyone can do to help improve their home’s insulation efficiency. The easiest thing you can do is to ensure that your doors and windows are closing and sealing properly. Make sure the weather strip around your doors and windows is in place and not crumbling or broken from age. Weather stripping is something that most homeowners can do to easily improve their heating and cooling efforts quickly and for very little cost. Some people will be tempted to install their own insulation thinking to save money, but we highly recommend you hire an expert for insulation installation. Of course, insulation isn’t everything and if you don’t have adequate windows to begin with, you’re going to run into problems. Older homes have single pane windows or windows that may not seal properly. For the most efficient home, you’ll want to install modern windows that insulate properly to help you with your insulation efforts. However, new windows are considerably more expensive than insulation, so we recommend that you first fix insulation issues as this will save you money in the short term every day and will help enable you to afford those window upgrades. You want to get the fastest solution at the best cost and insulation is the best way to achieve that goal. The summer time heat will be here in no time and you want to stay ahead of the weather. Call the insulation installation experts at Dimensional Contracting at (817) 966-9605. The call is free, the consultation is free. No obligation or high pressure, just an honest assessment and explanation of how we can help you. Our solutions are tailored specifically the our customers’ needs. No matter how big or small the project, give us a call and get an estimate from our insulation experts today.